Beyond editing your organization’s name and logo, the Settings page in the Grata Admin Panel allows you to customize a few important values for your organization. This is the master time zone for your organization. It affects your operating hours (more on this in the next section) and how your reports are calculated. Most reporting metrics in your Grata dashboard and reports are measured daily from midnight to midnight. Adjust your time zone here so reports are relevant to your organization. Individual agents can independently set their own time-zone from the My Settings drop-down menu at the top right of the Grata console to control their console time zone. These are the hours you intend to provide live chat service. Setting operating hours controls how Grata calculates your organization’s service level and whether to send customers your online greeting or offline greeting when they start a new conversation. If you don’t set operating hours, Grata will reply with your online or offline greeting based on whether or not there is at least one agent logged into your Grata console. Once operating hours are set, these hours will control your greeting messages, regardless of whether or not you have agents online. If your Grata implementation includes mobile agents using WeChat Work, note that these agents do not have an online status, so you should definitely set operating hours to properly manage your customers’ expectations. 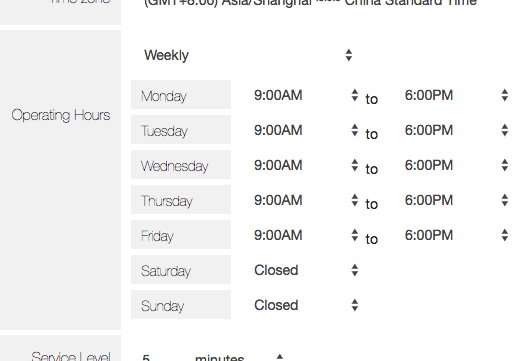 Select the “Daily” setting if your daily operating hours are the same for all seven days of the week. If you need to configure different hours for different days of the week, then select the “Weekly” option and configure each day accordingly. Your service level is your goal maximum time that a customer spends in the wait list, during operating hours, before being claimed by an agent. Service level is calculated as the percentage of total chats offered that are answered within the goal time you set. For example, if your service level is five minutes and your team claimed nine of ten users within that time, your service level for the day is 90%. If you don’t set a service level, the default value in Grata is twenty minutes. If the start time of a chat is outside of your operating hours, that chat does not affect your service level. Set a threshold number of users waiting to chat, at which point Grata will consider your team busy. When your team is busy, Grata can automatically override your online greeting message and instead send a busy greeting to help manage your customers’ expectations that they will likely have to wait longer than normal to chat with an agent. If you’re using Grata’s web chat plug-in, you can also use the capacity level setting to hide web chat from your site until your team recovers. This is an optional setting that lets you control the maximum number of chats an agent can have open in her console at one time. Generally speaking service quality drops off if an agent tries to juggle too many users at the same time. Another dangerous situation is when an agent leaves too many old chats open in her console — if she walks away from her computer and one of her old users suddenly messages, no other online agents will be notified as the chat is already claimed. A console with maximum concurrent chats set to three.